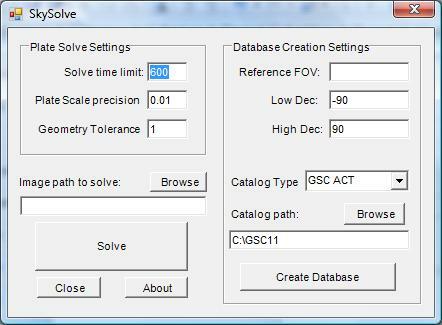 SkySolve is a utility I've been developing in my spare time after a discussion with Bob Denny at AIC2008. It is an application which is supplied an image and with no prior knowledge of where in the sky it was taken, it uses a star pattern matching algorithm and reference database to locate the correct image coordinates. This makes it especially useful for remote imaging observatories, where the mount pointing may become incorrect. The remote operator can simply take an image wherever the scope is pointing, then use SkySolve to locate the actual current pointing and then re-sync the scope to get the pointing back on track. I read a couple of research papers on the topic, then extrapolated the processes into my own algorithm, which I tuned over the course of a 6 month period. The basic premise is that a reference database is generated which uses the geometric relationship of sets of 4 stars to define a “shape” which is then stored in the database. Once an image to be matched is fed into SkySolve, it generates similar shapes from the stars detected in the image and runs a matching algorithm against the shapes in the reference database. If a candidate match is found, the resulting approximate image coordinates are fed into PinPoint (a commercial tool from DC3 Dreams) to validate the candidate and to get a high precision match. A licensed full version of PinPoint is required to do this, since the automation interface is only available in the paid version. The shape matching algorithm implemented in SkySolve does not require any initial knowledge of where in the sky the image was taken, nor does the rotation of axes inversion (flipping) if the image matter. The only image parameter SkySolve requires to be told is the plate scale. This is derived from the FITS header of the image being processed, so you should ensure that your image capture application has very accurate values entered for the telescope focal length and camera pixel size. An accurate value for the telescope focal length can be easily determined by using PinPoint to solve an image. Use the precise result from PinPoint to update the settings in your capture application. SkySolve is now ready for a first public release. This takes the form of a dual function application plus a plugin for MaximDL. The main application performs two functions – generation of the reference shape databases and All Sky plate solutions of image files. The plugin for MaximDL operates on the currently selected image open in MaximDL and launches the main SkySolve application to perform the All Sky plate solve. The application is distributed in a self-extracting archive file. Once this is run, the application installer will automatically launch, which installs the SkySolve application and also the SQL server compact edition database engine from Microsoft. You must accept the Microsoft EULA for the SQL-CE for the install to proceed. After the installation is complete, the application will launch itself, showing the main screen as shown below. If it does not already exist, a program group will be created entitled “John Winfield”, wherein all my released applications will be found. This will also contain links to this guide and the release website where updates will be posted. The right side panel is used to create the reference databases. This uses a star catalog, the same as is used by PinPoint for local plate solving. Currently two databases are supported – the GSC-ACT catalog and the USNO A2.0 catalog. The GSC catalog is the same GSC1.1 as used by PinPoint. The ACT corrections are automatically applied internally. Both are available for download from the Internet, although if you are already using PinPoint you will probably already have one of these. The USNO A2.0 catalog is significantly denser than the GSC-ACT catalog and so contains more stars for narrow fields of view (fov), but this density also makes it far slower to access while building up the reference databases. I would strongly recommend using the GSC-ACT catalog. In my testing I found this to give good results down to the minimum practical fov supported by the database generation application of 18 arcmins. The left side panel is used to configure the tolerance parameters used for solving an image and to specify the path to the image to solve. Before you can solve any images, you must generate corresponding reference databases. The database generation is a one-off operation for any given telescope+camera combination, the resulting database will be used for solving all images of the corresponding fov. In order to generate a reference database, one must specify the field of view (fov) of the images which will be solved. Typically a user will only have a few different telescope+camera combinations, each combination will typically yield a different fov and thus a database will need to be generated for each. The “Reference FOV” setting is measured in arc-minutes (arcmins). The value to be entered should be that of the smallest dimension, e.g. for a setup which yields an image fov of 28.3arcmins by 18.1arcmins, a value of 19 should be entered. The value entered should be as accurate as possible – do not “pad” it or round up or down, but rather enter the next largest integer value than the smallest fov dimension. If desired, the area the database is to cover can be restricted to just the sky visible above your local horizon. Restricting the are to just that which will be imaged speeds up database generation and subsequent solutions. The “Low Dec” and “High Dec” values are the lower and upper bounds of Declination which will be covered by the database. The values are in degrees, from -90 to +90. For example, from my location in California, I can't image below a Declination of -50 degrees, so I can set my “Low Dec” to -50 and my “High Dec” to 90. The “Catalog Type” drop-down allows the user to select either the GSC-ACT start catalog or the USNO A2.0 star catalog. As mentioned above, I would recommend currently using the GSC-ACT catalog for speed. The “Catalog Path” must point to the base folder containing the catalog – this is the same path you would normally configure for PinPoint. There is a browse button to allow you to browse for the catalog base folder. Once you have configured the above settings, press the “Create Database” button and the reference database will be created. N.B. The database generation process is very computationally expensive. Generating a reference database for the smallest GSC-ACT fov (18 arcmins) can take 4 days and it generates a database of approximately 3.5GB in size, containing over 28 million reference shapes. Larger fovs are much faster to generate – the database for a fov of 24arcmins takes approximately 10 hours and is 740MB in size whereas the database for a fov of 164arcmins only takes about 30 minutes and is 22MB in size. A warning will be displayed if you already have a database for the specified fov you are trying to generate. Once a database generation starts, the main application window is replaced by a log window, showing progress. The content of this log window is replicated in the log file in the SkySolve folder under the user's Documents folder. As the database grows, a percentage complete is displayed along with an estimate of the time to complete the initial shape generation. Once the shape generation is complete, there is some database housekeeping and index building to perform, which can take up to an additional 10% of the shape generation time again. The reference databases, along with other config files and the log file are stored in the user's Documents folder, in a sub folder entitled “SkySolve”. Once you have generated the reference databases for the fov of the images you wish to solve, you can use the left pane of the main application to perform All Sky plate solves of images. “Solve Time Limit” - this is the time limit in seconds after which SkySolve will give up if a solution has not been found. The default value is 600 seconds (10 minutes). “Plate Scale precision” - this is the level of precision to which the plate scale of the image is known. Since the pixel size of the camera is typically exactly know, this value is typically a reflection of the precision to which the telescope focal length is known. A very accurate value can be obtained by using PinPoint to solve an image taken with the telescope+camera combination. This field also allows one to relax the plate scale tolerance somewhat if the plate scale changes over the surface of the image – typically as a result of image distortion caused by the optics in the telescope or from things like focal reducers. The default value is 0.01, i.e. a precision of 1%. Setting a higher value here will allow a less stringent match to the reference shape's scale, which may aid solving of somewhat distorted images, but may result in more false candidate matches which must be rejected internally, increasing the solution time. Increasing this above 0.1 is not recommended. “Geometry Tolerance” - this is a factor used to scale up the allowed shape matching tolerances. The default value is 1. Using the default setting of 1 uses the built-in shape matching parameters. Increasing the value allows a greater difference between shapes being matched. Use with care - it can increase the number of false matches but is also useful with distorted images. One can increase this value in fractional steps – try increasing by steps of 0.1 to see if failed images can be solved. A max setting of around 2 is recommended. Initially, I would recommend using the default values and only trying tuning of these values if you have trouble solving images. Finally, enter the path to the image to solve or use the Browse button to select an image, then press the “Solve” button. Once an image solving run starts, the main application window is replaced by a log window, showing progress. The content of this log window is replicated in the log file in the SkySolve folder under the user's Documents folder. For convenient access to the SkySolve application, I have also created a plugin for MaximDL. This plugin takes the form of a file named “skysolve_plugin.dll” which will be found in the SkySolve folder in the user's Documents folder. To install this plugin into MaximDL, simply launch MaximDL and select the “Add/Remove plug-in...” option from the Plugin menu. In the window which opens, click the Browse button, then navigate to the Documents\SkySolve directory and select the “skysolve_plugin.dll” file and click OK. Then click Close to close the plugin management window. You will now have a new option on the MaximDL plugin menu entitled “SkySolve”. Now, you can run SkySolve against any open MaximDL image by simply selecting “SkySolve” from the plugin menu. This will automatically pass the open image to SkySolve and display the standard log window while it attempts to find an All Sky plate solution. If it is unsuccessful, an error message will be displayed, but if it is successful it will set the “OBJCTRA” and “OBJCTDEC” FITS keys in the image to the coordinates located by SkySolve and then automatically launch PinPoint to update the image FITS header with the detailed PinPoint plate solution based on the coordinates located by SkySolve. Once the SkySolve plugin is installed into MaximDL, it presents an automation interface which makes scripted All Sky plate solves possible. “PlateSolveOK()” this returns a boolean type – true if the previous solution attempt was successful, false if not. When accessing the scripting interface directly, all popup messages are suppressed, so it is safe to use in a fully automated configuration. MsgBox "No argument filenames were provided"
Before installing the update, close MaximDL to ensure the Plugin file can be correctly overwritten. If the plugin appears to fail to run after the upgrade, remove it from MaximDL then re-add it. v1.1 - Initial public release. v1.2 - Fix plugin to work correctly with Windows XP. Improve validation of entered config fields. v1.3 - Apply filtering to remove duplicate or bogus stars in the image star detection process, speeding up the solution and making it more robust in noisy images. v1.4 - Dynamic max mag setting for the PinPoint solution confirmation run. v1.5 - Fix problem where the stored image RA/Dec were not updated if existing values were already present.